The Tamiya Universal Carrier has been around for a long time and this was the first replacement figure I have seen for the kit in all that time. Resicast have their own excellent range of update sets for the Tamiya kit, many of which have been reviewed and can be found Here. 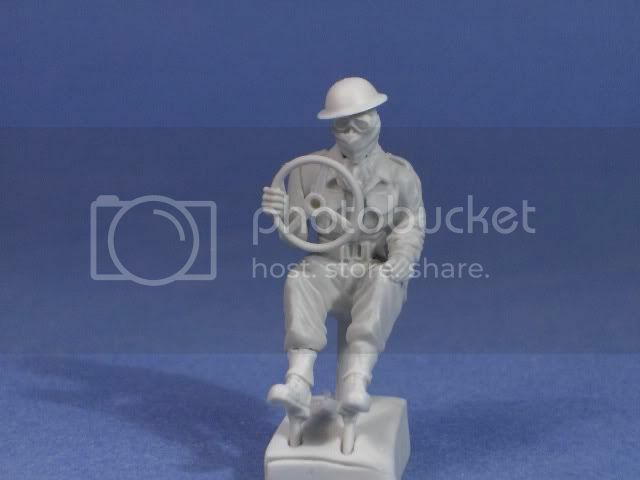 After this fellow, Resicast released a set of 2 figures, Reviewed Here, in the form of an RA Crew and stowage for the T16, although I believe they could be used as crew in any universal carrier successfully. So in a short space of time we have been given the makings of a complete new crew for the carriers, although a new vehicle commander would also be very useful! The figure comes packed in the standard double zip bag with a paper insert, typical of all Resicast figures. On the front of the insert is a good colour picture to aid in painting along with the product information and the makers contact address and logo. The bag also contains a small typed insert about driver placement (see picture). This is a full figure made up of 6 separate parts, the main body, head and right arm, and with the figure you get a choice of 3 alternative heads. Cast in a light gray resin, I could find no flaws in the pour. A little clean up will be required around his backside to remove the pour stubs and some flash from under his left arm, but a sharp X-acto blade is all you should need to tidy up these areas. The figure is depicted wearing 37/40 battle dress with a web belt. The brasses are in evidence both front and rear, and around the neck of the body is a good representation of a camouflage scarf. The uniform has good sharp detail, nice natural folds and the correct number and placement of pockets. On the lower leg are a good set of anklets and ammo boots, again with good detail, although the straps on the right anklet aren’t great. Mind you, inside a carrier that won’t really matter. 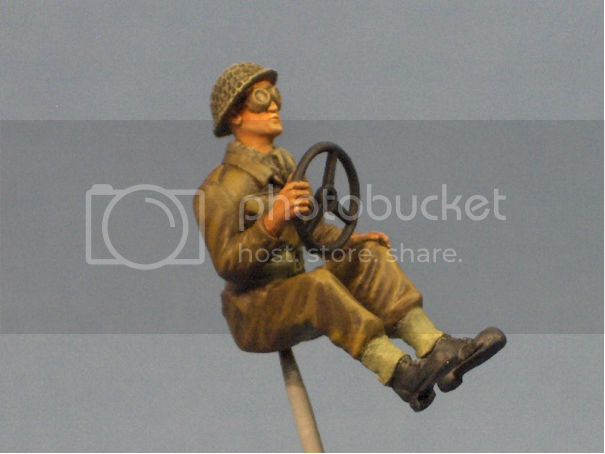 Obviously for a driver he is in a seated position and his left arm is resting on his left knee. The right arm comes as a separate item, arm bent at the elbow with good cuff detail and the hand comes attached to a replacement driving wheel, so careful removal of this part will be required. Most notable is the one with a bandana around the face and wearing a pair of goggles. This had a little flash around the neck which will need removed. On top of this head is a Mk II helmet without scrim or netting. If you have a dust situation in mind then this is a very useful head. Head 2 comes with the face wearing a pair of goggles only, the remainder of the facial detail being exposed. On this head is a Mk III helmet with netting. Again well cast for a dusty/bright setting. This shows the face of a young man, the expression fairly relaxed and on top is a Mk III helmet with netting. The helmet is tilted slightly to the left giving a nice individual touch. All three heads should paint up very well and allow for some variation in the driver setting. Head 2 and 3 would suit NWE and head 1 could be either in NWE, N Africa, or the Far East. Buyers should note that this is a full figure and it may be necessary to sand down the divers back to get the fit you need. Normal precautions apply when working with resin. This is a welcome alternative to the old Tamiya Universal Carrier Drivers. Excellent casting with minimal clean up required, the choice of 3 alternative heads should be very useful to modellers. Dressed and posed as the figure is, it has the feel of a relaxed individual. I don’t know for sure but I would suspect that with a little alteration this figure could also be used in trucks and jeeps, and even tanks. At lease I hope so as I bought 2 with that purpose in mind. With a change of right hand and due to the full uniform, this chap could also be posed sitting outside a vehicle, so would appear to be a very flexible and generic figure should you need a seated soldier, either tanker or infantryman. Highs: A nice simple figure with a variety of generic uses and a welcome replacement to the old Tamiya Universal Carrier driver. 3 alternative heads and good sharp detail, make for another excellent figure from Resicast. Hi John and Rudi, Input appreciated folks. Regarding use in other vehicles I would assume so, although some minor adjustment of his backside and back might be necessary, I will be checking that out when I have him built as I'm alwasy on the lookout for truck drivers, but I'm hopeful Ask and ye shall be given a couple more shots I borrowed from the Resicast site. Hope these help. Al Edit, John, Remember Ulracast and Dougs Originals have a driver figure specific for the Tamiya jeep.